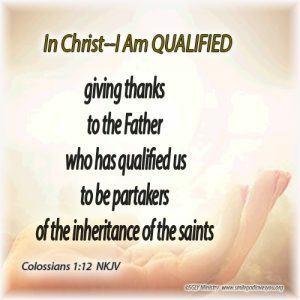 Believers, at times in this world we may feel we are un-qualified or we are told we are un-qualified, but in God’s kingdom we are very qualified because, in Christ, God has given us all we need to be equipped and fit for eternity. In Christ, we will never be told we aren’t good enough or that we don’t measure up, for our Father God has qualified us. In Christ, we have been transferred from darkness into light. We are now children of the light. Christ is the light of the world and His Spirit is within us, so we have His light in us. In Christ, we are saints because of His righteousness. We are on earth, but bound for heaven where we will receive our eternal inheritance and dwell in the light with all the other saints forever. Yes, let us for sure give thanks to the Father for all of this!! !